Hello friends! My name is Robin and I am The Kinected’s Fan Club President / Coordinator. Our objective is simple: to have a central location to discuss The Kinected, and to also help spread the word about the band. If you haven’t had the chance to meet these guys, or see them perform live, you are really missing out. Their music is incredible and we need to help spread their message. Thanks to you all, we have been able to accumulate an army of over 400 people deep in my short time working with The Kinected. 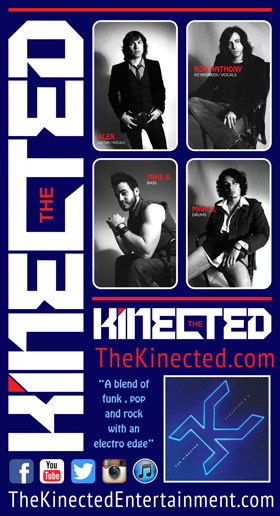 If you would like to know more about the Fan Club and how you can become a part of it, please shoot me an email at kinected@yahoo.com. Thank you so much for your time, and I look forward to hearing from you. All the best! Thu, May 2 5:00pm Blue Pointe Bar & Grill (Duo) Tequesta, FL. Sat, May 4 7:30pm Steam Horse Brewery (Duo) West Palm Beach , FL. Wed, May 15 6:00pm Alex Zapatier @ Carmines Coal Fire Pizza Jupiter, FL. Fri, May 17 6:00pm Alex Zapatier @ Tequesta Brewery Co. Tequesta, FL. Sat, May 18 6:00pm Alex Z w/DJ Supreme1 @ Private wedding Palm Beach , FL. Thu, May 23 7:00pm Flash Beach Grille (Trio) Hobe Sound , FL. Tue, May 28 6:30pm Maxi's Lineup (Duo) Jupiter, FL. Fri, May 31 3:00pm Blue Pointe Bar & Grill (Duo) Tequesta, FL. 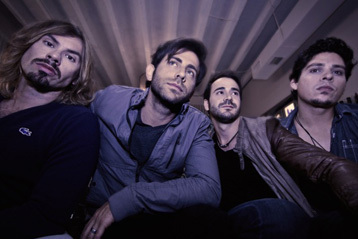 Fri, Jun 7 8:00pm Square Grouper - Jupiter Jupiter, FL. Fri, Jun 21 7:00pm Blue Pointe Bar & Grill (Trio) Tequesta , FL. Tue, Jun 25 6:30pm Maxi's Lineup (Duo) Jupiter, FL. Sat, Jun 29 7:00pm Terra Fermata (Full Band) Stuart, FL. Fri, Aug 23 6:00pm Alex Zapatier @ Tequesta Brewery Co. Tequesta, FL. Tue, Sep 3 6:30pm Maxi's Lineup (Duo) Jupiter, FL.